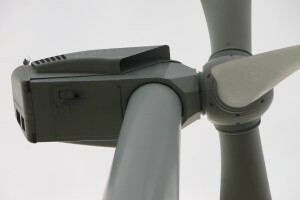 The wind turbine 104/2500 is a production of FWT Trade GmbH, a manufacturer from Germany. This manufacturer has been in business since 2013. The rated power of FWT 104/2500 is 2,50 MW. At a wind speed of 3,5 m/s, the wind turbine starts its work. the cut-out wind speed is 25 m/s. The rotor diameter of the FWT 104/2500 is 104 m. The rotor area amounts to 8.495 m². The wind turbine is equipped with 3 rotor blades. The maximum rotor speed is 16,5 U/min. The FWT 104/2500 is fittet with a spur/planetary gearbox. The gearbox has 3 stages. In the generator, FWT Trade GmbH sets to doubly fed asynchronous. The manufacturer has used one generator for the 104/2500. The maximum speed of the generator is 1.570 U/min. The voltage amounts to 690 V. At the mains frequency, the 104/2500 is at 50 Hz. In the construction of the tower, the manufacturer uses steel tube / *lattice. As corrosion protection for the tower FWT focuses on painted. There is one picture of the wind turbine 104/2500. There are no models for this wind turbine. We have power data on the 104/2500 from the FWT in the system. You can see the powercurve in the diagram above. The FWT 104/2500 has been listed since 07.02.2015. The last modification of the master data was made on 07.02.2015.